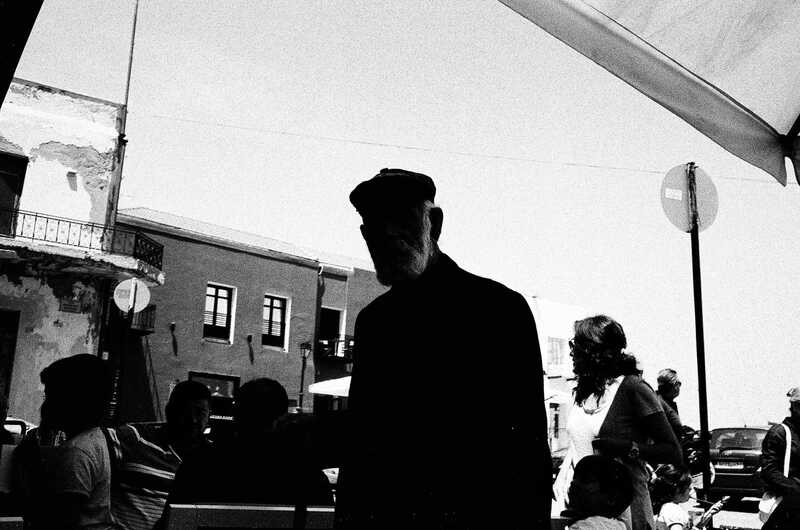 This is a photograph that has been shot with a Yashica Electro 35 CC and Kodak Tri-X 400 film, in Rethymno, Greece. It is 01:24 am and I am in Athens as I am writing this. I am listening to “Fly like an Eagle” by the Steve Miller band. Great tune. It has been a busy day and I am late for writing my Weekly Street Hunters Pic post due to the the fact that I have been in meetings for work from 11:00 am until 21:00 pm. After that I had dinner with my mates and saw a movie to unwind. I just got back home and I thought that I should go through my photographs and choose a Pic of the Week. My aim at this moment was to choose the photograph and go to sleep so I can wake up in the morning and write my post. But, as I was searching through my work, moving on forward in time since my last Pic of the week called “Wrecked”, I stumbled upon this photograph. 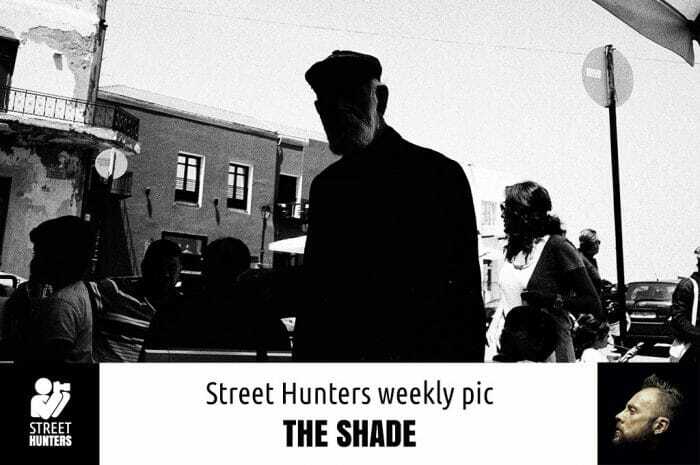 “The Shade” is the photo of a Cretan Elder looking in my direction. His characteristics can’t be seen because he has been underexposed. The only thing that is visible from his face is the fact that he has a white beard. Only part of it can be seen, but it is clear that it is what it is, a white beard. He is wearing a leather cap and a blazer of some sort. I took this photograph using Kodak Tri-X 400 and a Yashica Electro 35 CC. The CC is one of the smallest Yashica Electros with a wonderful pancake 35mm f1.8 lens that is crazy sharp. It is full metal and built like a tank. I wish all Yashica Electros were made as sturdily as the CC was. I really love that camera, even though I haven’t used it in a while. The day this was shot I was having a coffee with my family in the Old Venetian Harbour of the town I live in called Rethymno. Rethymno is the 3rd largest town of Crete. Some class it as a city, but I think it is not bigger than a town. The size of the place is irrelevant so I will continue. It was a hot Sunday morning and I was having a coffee. Everyone was in their t-shirts, drinking cold beverages or eating ice cream. I was sitting down at a table and I was taking photos of my daughters with my Sony NEX-6. I also had my Yashica strung around my neck set up and ready to snap. It was zone focused, it had a roll of the amazing Kodak Tri-X 400 inside and was waiting for that moment when I would choose to use it. Out of the corner of my eye, I saw this Cretan Elder approach my table. He was heading somewhere behind me. I saw him and was instantly attracted by the fact that he was wearing a black blazer and a black leather cap in the middle of the summer. I automatically left the Sony NEX-6 on the coffee table, grabbed my CC, brought it up to my eye, exposed for the sky, reframed and took a photo. By the time my finger was coming back up, the man had walked past me. I had managed to get one photograph. I was confident enough that the Yashica had caught the moment at a fast shutter speed, due to the very bright light. The Yashica is an Aperture priority camera which means that you can only shoot in that way. So, shutter speed is automatically selected by the camera. It can go anywhere from 1/30th up to 1/500th of second. I was sure that the photo had been caught at maximum shutter speed. It is 01:48. My tune just changed. “Riders on the Storm” by The Doors. I love that song.